Flashing the Square,edited by Linda Godfrey and Bronwyn Mehan. Spineless Wonders 2014 and Writing to the Edge, edited by Linda Godfrey and Ali Jane Smith. Spineless Wonders 2014. In the introduction to Flashing the square, the editors mention the “problem” of how to read short and micro-fiction and suggest various approaches, including “on the ceiling while you are sitting in the dentist chair.” Having been produced as a companion publication to Richard Holt’s video installation Flashing the square (Melbourne Writer’s Festival, 2014, in Federation Square), this idea isn’t necessarily absurd. This, however, is a book, and it presumes a more relaxed situation, a matter of choice about when to take time to read rather than be distracted from scraping, drilling and grasping tools. Almost as a comment on how to read micro-fiction and prose poetry, the left hand pages are blank. This creates a visual space that is unusual but very helpful in a collection of very intense, occasionally difficult pieces which require both visual and intellectual space if they are to be assimilated. Corners. Jolting. Shoulders, elbows, knees, bags and flat faces, various tablets with their soft illuminations, their persistent genii. One simply refuses: to have a conversation. The other seethes: you wouldn’t know if you were having a conversation. And the first, triumphant in closing some esoteric syllogism, nods: a conversation is when someone hurts someone. Silence. This marvellous observation is dropped into our awareness then taken away again as Pilkington returns to a description of being on a tram in the aftermath of the conversation. The works in this particular book often require patience, and expect the reader to delve deeply into themselves and their lives, fleshing out the story with an understanding of the possibilities lying within the words on the page. In many respects, what I’ve said reflects my own difficulties with the book, and one of these difficulties was a particular surprise to me. I experienced on ongoing urge to revise and re-write many of the pieces. This is an urge to which I am not accustomed, except with my own work. Usually I just don’t like the piece I’m reading, and I move on, or put it down and don’t read it. But these pieces kept me reading even when I stumbled over an idea or word. When we turn to Writing to the Edge, the situation is quite different. None of the pieces seem smaller than the ideas and story they are presenting, and I feel more at home reading this book. Not just old like your granny. But older. Older than anyone else you’ve ever known about. And they’re there at every funeral of an elderly person. No one calls them. They know when to appear. Aunt Jane is in father’s bed. Uncle Jack is in mother’s bed. I’m in bed with seven cousins, male, female, trans. Who will do what to who is anyone’s guess. For the most part the longer pieces are more akin to what we think of as “traditional” stories, a perfect example of this being Mark Smith’s Joanne Burns Award winning ‘10.42 to Sydenham’. The “problem” of how to read micro-fiction does not appear in this volume; nor did I feel the urge to revise or re-write any of the pieces. There are challenges and ideas needing to be experienced, and they left me feeling fulfilled and happier for the reading. All in all, Writing to the Edge is a much more pleasant volume to read; it is the book you would give someone who doesn’t usually read micro-fiction. Flashing the Square is the book you give to someone who already reads and likes micro-fiction, someone who is up to the challenges it provides. Rochford Street Review relies on donations to cover costs. Any funds left over are used to pay reviewers. Thank you Spineless Wonders, Bronwyn Mehan, Ali Smith and Linda Godfrey for having me here to launch this great collection of prose poems and microfiction. I’m honoured. What is it that makes great reading? For people who love novels – and I admit, that’s usually me – it’s about rounded characters. Driving plotlines. Sweeping narrative arcs and a precise use of language. It’s about escaping to another world and having a bit of time there. Microfiction and prose poems don’t have the luxury of set-­‐up because as soon as the story begins, it’s over. It doesn’t have time to take too much time. Poetry, I think, might be a little easier, because you can force the reader to slow down by using imagery and metaphor in beguiling ways but even so the mastery is demonstrated in the brevity. 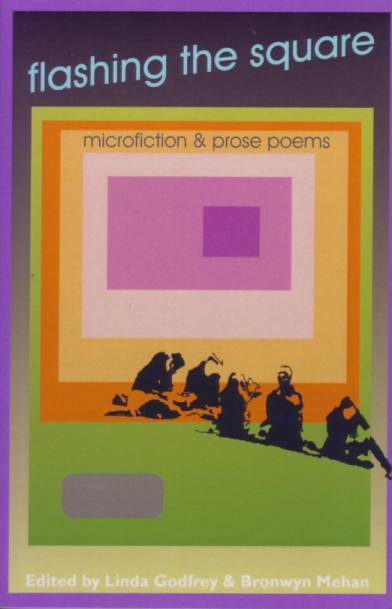 This is a marvellous collection of pieces that straddle prose poems and microfictions. And I LOVE that there’s a publication that places these pieces side by side because I think there’s a lot the prose poem can learn from the microfiction and a lot that the microfiction can learn from the prose poem. Sydney writer Bridget Lutherborrow once said that she reads a microfiction for its ending. That the final lines of the microfiction need to shift the narrative status quo and take the story someplace unexpected. And I was thinking about this as I was reading through the long-­‐listed entries for the Joanne Burns Award. And to be clear: not all of the pieces in the book were entries for the award, but many were. It was a difficult task – judging the winner – but I chose Mark Smith’s ‘10.42 to Sydenham’, a short-­‐short story about a girl being bullied on the train from the perspective of an African migrant, because of its ending. It’d be easy to overdo the themes in this story, to rely on stereotype or the grotesque – but by using tight, controlled language, he expertly leads the reader through the shifting loyalties of the story. There’s set-­‐up, tension, and a resolution that’s not as smooth as we were expecting. And this discomfort, this ending, is what makes the story. It’s a tight, thoughtful microfiction that stays with the reader after the book is closed. Well done, Mark. The runner-­‐up prose poem ‘Happy’ by Hilary Hewitt lands at the other end of the prose poem-­‐microfiction continuum. I adore this piece! It follows Hao Zianzhang and his boutique pear venture. What wit! What use of language! This combination means we’re willing to follow the author from the markets of the first line to the marketing campaigns of the last without question. The poem tackles consumerism, waste, communism, infanticide and poverty in thirteen lines and the reader wants more. What? Yes, it’s true. It’s crazy. But each word is precise and this kind of care is riveting. And I also really enjoyed runner-­‐up Mark Roberts’ ‘Cities that are not Dublin’. There’s a wonderful sense of Australia answering back to the colonial canon. The lulling pace and use of white space add to the ambience so that the reader, too, feels like they’re tucked beside a train window, burrowing into Ulysses. These winning entries were all about Australia’s place in the world or the world’s place in Australia. It’s hard to pull off characters that are both personal and universal – but that was the core strength of these three pieces. We’re taken beyond ourselves, and in that process, recognise ourselves. 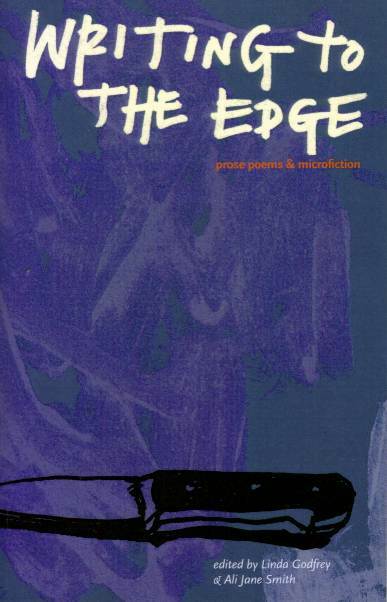 Other top pieces in Writing to the Edge: Philip Hammial has some enchanting vignettes that hover between poem and micro-­‐micro-­‐fiction. Elizabeth Hodgson’s ‘Timeless Crones’ honours the ‘older than anyone else you’ve ever known’ women. Patrick Lenton’s ‘Phraseo Rogue Editor’ excited my inner editing teacher, and made me laugh aloud. That a great first line ‘Adelie kept a locked book of recipes for black’ in Richard Holt’s ‘Her Dark Ground’. And Julie Chevalier’s ‘she cut a whole room of baby furniture from a catalogue’ in ‘The Man Who Walks After Work’ was a great moment that stayed with me. Oh, and the brutal banality that Jenni Nixon exposes in ‘Engaged’. All of it: great stuff. In essence, this is a superb collection of Australian prose poems and microfiction. Make sure you buy five copies straight away and get some of the marvellous authors who are here tonight to sign them for you. And finally thank you publisher Bronwyn Mehan and the crew at Spineless Wonders. Thank you editors Linda Godfrey and Ali Jane Smith. As Moya Costello said at the Byron Bay Writers’ Festival a few weeks ago: “you guys are real deal”. The most innovative stuff in Australian publishing right now! Thank you for putting out another superb book. I officially launch Writing to the Edge. Shady Cosgrove is a senior lecturer at the University of Wollongong. Her books include What the Ground Can’t Hold (Picador, 2013) and She Played Elvis (Allen and Unwin, 2009), which was shortlisted for the Australian/Vogel Award. Her short fiction and articles have appeared in Best Australian Stories, Overland, Southerly, Antipodes, the Age and and the Sydney Morning Herald.